What shoes are best for fencing? Some believe that shoes made specifically for fencing are best, while others think that with the millions of athletic shoes that exist in this world, there’s bound to be good shoes made for other sports that would also be good for fencing. Both groups are, of course, correct. What are the elements that make a shoe good for fencing? Type: Fencing is an athletic sport and needs an athletic shoe. Casual lifestyle “tennis” or “basketball” or “skate”shoes will not fit the bill. Athletic shoes made specifically for the sport of tennis, raquetball, squash, or volleyball can often work fine for fencing. Fit: The shoe should have a snug, proper fit. There should be extra room in the toe-box to allow for a hard lunge that does not allow the toe to jam into the front of the shoe. I order my fencing shoes ½ too large for this reason. There should not be excessive room for side to side movement in the shoe. 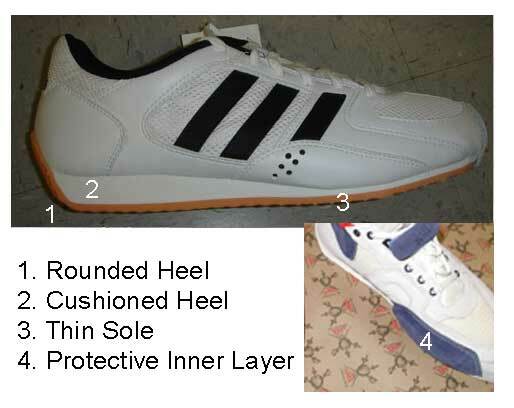 Heel Cushioning: The front heel takes a lot of abuse from lunges. Nike reports that fencers are able to exert seven times their body weight onto one heel on one lunge. Less expensive shoes often lack sufficient cushioning to prevent bone bruises on the heel. Fencers combat this by using heel cups and/or padded inserts available at sporting supply stores. Weight: A heavy, clunky shoe simply does not provide for smooth, quick footwork that fencing demands. Also, some fencers really like to be able to feel the floor through their shoes, and clunky shoes don’t allow that. Lateral support: When the foot is able to move too freely in the shoe you lose power and get blisters. So. Again… What shoes are best for fencing then? Short answer: Nike Ballestra’s, Adidas Stabil 5’s, Yonex Badminton Shoes, Mizuno Volleyball Shoes, Leon Paul Scimitar’s, and more. Longer answer… Basically there are two main camps revolving around this question. The “Slipper Sole” camp and the “Court Shoe” camp. What shoes are not good for fencing? Running Shoes- Distance (No lateral support, can twist an ankle, clunky).